Bacteria have sizes in the micrometer range, whereas phages range in the nanometer scale. Also it should be noted that initial microbial contamination in clean processing plants are extremely low. For example, in a 2005 study by Gombas et al., over 30.000 susceptible foodstuffs were tested for presence and numbers of Listeria. About 1.8% of all the samples tested positive, and of these 70% where at the detection limit (i.e. 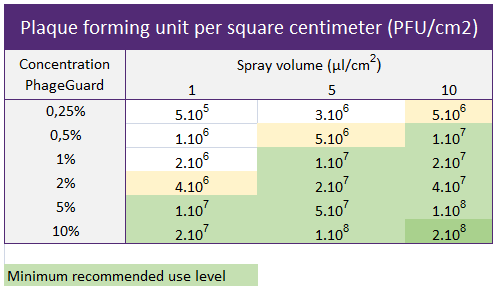 1 CFU per 25 g) and only 3.6% of samples had numbers exceeding 100 CFU/g. Moreover the products were purchased in retail at some point within their shelf life indicating that original contamination at the point of manufacture would have been even lower. The surface area of foodstuffs is vast to microorganisms. Figure 1 shows the possible distribution of two phage dosages in 1 millionth of a square centimeter. A bacterium has also been added to illustrate these relationships. 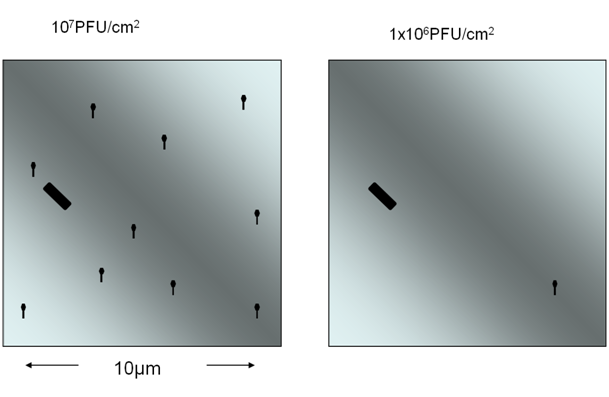 Fig 1: Possible distribution of 107 and 106 PFU/cm2 (plaque forming units) in 100µm2. Considering that the motion of a phage is completely random the figure illustrates why below 106 PFU/cm2 little to no effect can be expected and that 107 PFU/cm2 is likely to result in a significant reduction of contamination. Given the low initial contamination rates (perhaps as little as 1 bacterium per 1000 packages) a 1log kill would shift that number to 1 in 10.000 packages and a 2 log kill would reduce it to 1 in 100.000 packages thus contributing significantly to food safety.